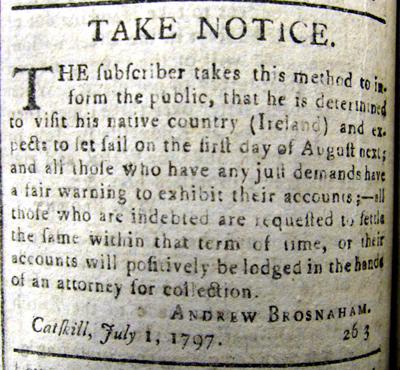 Andrew's notice of his upcoming trip in August 1797 states that his native country is Ireland. A descendant/researcher stated that her grandfather, Frank Gale Renshaw, was told by his grandfather, Dr. John Brosnaham, on a trip to Catskill, that Andrew came from County Tyrone in Ireland. Image provided in 2010 by Sylvia Hasenkopf, Greene County, New York, U.S. GenWeb Coordinator, who said it came from a local newspaper, name of newspaper not given.